PS - Don't forget to vote in the "Dogs of Blogville" calendar contest hosted by "Heart Like a Dog" and "The Daily Dog Blog". It's easy-peasy, no registration or email sign-ups - just choose, click and vote. One vote per IP address per 24 hours. Contest ends Sunday at 12 noon. So we entered this contest to be a part of the "Dogs of Blogville" calendar this year. I think Bella's picture is cute and have been pestering all of my friends to go vote for her. But I'm changing my stance and asking them, and now you, for a different action. The "Dogs of Blogville" calendar is a fund-raiser hosted by Jodi Stone of "Heart Like a Dog" and Julie Melfi of "The Daily Dog Blog". It's in its second year. This year, the money raised from the calendar will be going to "Two French Bulldogs" to help with some of the costs from Benny's cancer treatments. I really want to see the calendar be a huge success for Benny. But I saw something today that made me think there was something "rotten in Denmark". Not that there's anything wrong with the contest - it's totally on the up-and-up: you can only vote once per IP address per day so Julie and Jodi did a bang-up job securing the process. What I noticed though is that, based on the votes as they currently stand, Benny may not even make the calendar being made in his honor. And that's just not right. So I'd like to ask everybody who reads this to please go over to the "Heart Like a Dog" voting page and register their vote for Benny and Lily. It only takes a minute and you can vote every 24 hours. Recruit your friends. I'd really love to see Benny on the cover of the calendar and I'm going to campaign hard for them for the next several days the contest runs. Would you help me spread the word? You're gonna go vote for Benny now, right? Not my fanciest video but certainly one of my proudest moments. Yay, Bella. Who's the scared-y dog now? These pictures all have a time stamp of 2:55 pm on them so they were taken in the same minute. Somebody hears Bailey, the neighbors' dog who she's afraid of. 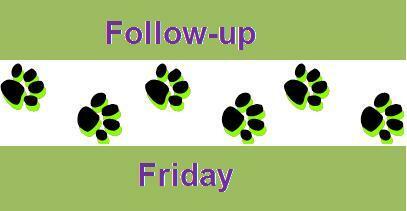 Today we're joining Heart Like a Dog's Follow up Friday blog hop. Thank you Jodi, for inviting us all to join the hop that "let you wrap up the week and leads you right into the weekend." I wanted to follow up on our Through the rabbit hole post because Bella's reaction to the rabbits has rather surprised me. Nothing quite asdramatic as Beau's reaction, mind you, but our expectations are more than a little different between the two dogs. Bella has a pretty high prey drive and goes absolutely Cujo at even the long-distance sighting of a squirrel. So when I realized the rabbits were grazing on the INSIDE of her fenced in area, I got just a little nervous for their safety. Imagine my surprise when one day I let Bella into the area and saw a bunny go high-tailing it across the yard with Bella in pursuit. Note that I did not say in "hot" pursuit. The bunny was moving full-speed. Bella, surprisingly, was not. She was chasing it but not with any real conviction. 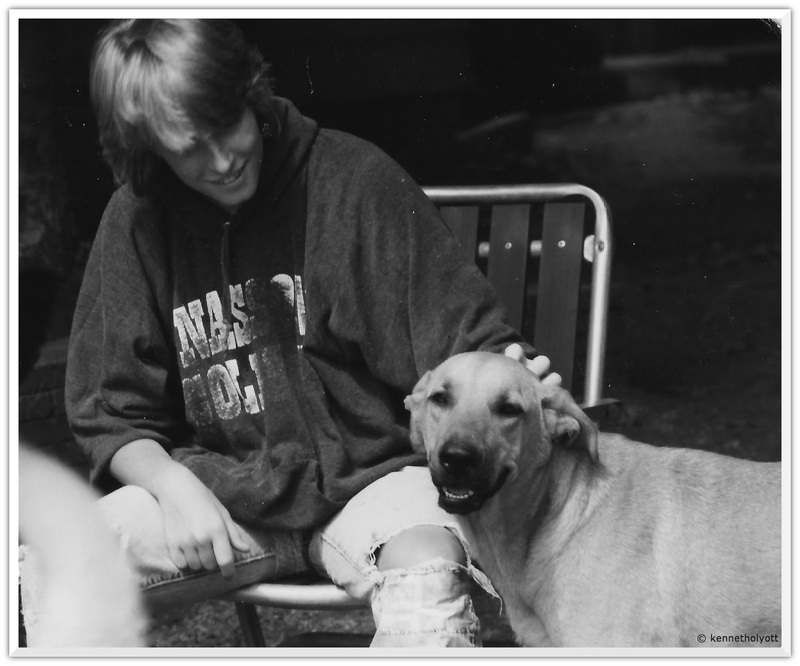 After a few years, I think you get to know your dog. Especially when, as in our case, you've had to pay special attention to her subtle signals. When Bella sees a squirrel, she gets all up in full-on attack mode: hackles raised, ears forward, body tense. While I watched her 'go after' this rabbit, she was showing a much more relaxed posture - more like play than fight/hunt. And she was nowhere near moving at full speed. I wonder, what does Bella sense about squirrels that makes her go haywire that she didn't sense in the bunny? I don't have a clue and would love to hear your thoughts about it. I do think it's telling that the rabbits seem to feel safer inside the enclosure than outside. Maybe it's because they usually know when Bella's coming due to opening doors and a crazy hu-mom that calls out a warning to them. In other news, our thoughts are still with Marquie and her family, as well as all our other friends who have lost their beloved companions in the 2 years we have been blogging: KB and her beautiful K, The Houston Pittie Pack, Jana's Jasmine, Mrs. Taleteller's beautiful Blueberry, Mister Mango, regal Remington, the charming Au, sweet, baby Charlotte, the lovely Cali, gorgeous Gizmo and ever adorable Howie. Sadly, I am sure I have missed too many more. I would also like to offer a special verbal hug to our own friends Sheila and Matt who lost their beautiful Kismet in a tragic and horrible situation this summer. You are always in our thoughts. Finally, thanks for all the kind words about our blogiversary. It has been a unique pleasure getting to know all of you and your animals. Your friendship, kindness, encouragement and wisdom has taught me so much. Here's to another two years of sharing stories, celebrating successes and comforting sorrows. Cheers! Two years ago today, Bringing up Bella published our first post. Then she found out that she would get treats for modeling. But sometimes we lose dear friends and times are sad. But the pet blogging community always rallies around the folks who are hurting or in trouble and it makes us all very hopeful as we look to the future. So all in all, Bella has decided this blog thing is a-okay and she is ready for her close-up. Thank you everyone for hanging with us, sharing our journey and rooting us on. "We love having you here." We have rabbits. We have a fenced in area for Bella. The rabbits and Bella often occupy the same space. This makes for a precarious situation for the rabbits. So we cut holes in the bottom of Bella's fencing to let the rabbits come and, more importantly, go - quickly - when they have to. Bella is not impressed.